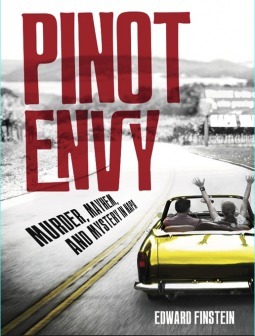 On July 16, just in time to make a splash in mystery fans’ summer reading, Pinot Envy hits the shelves dripping with praise. The latest title from Bancroft Press features a murder mystery set in motion by the theft of a unique bottle of red. Created by Edward Finstein, best known to fans as The Wine Doctor, this burgundy-stained murder mystery twists and turns from Napa Valley to the scenic hills of San Francisco. The novel follows Woody Robbins, an atypical investigator, as he sniffs out clues surrounding the disappearance of a rare and valuable wine formerly in the collection of Napoleon Bonaparte. Although this is Finstein’s first novel, it is hardly his first time in the writer’s chair. Besides his television and radio presence, he comes with a list of magazine and periodical columns a mile and half long including Recreation News, Beach Metro News, Elite Wine, Food & Travel, and more. He has made a career of sharing wine’s finest features with a wide audience on air and off. As a professor of wine at George Brown College, School of Hospitality & Culinary Arts, and one of the few wine appraisers in Canada, his expertise is renowned. Having penned the acclaimed non-fiction Ask The Wine Doctor, Finstein was perfectly poised to bring his passion into the world of fiction. As of July 16, Pinot Envy is available at Amazon, Barnes & Noble, and bookstores everywhere.